Ms LANDRY (Capricornia) (09:51): Today I urge all men in Australia to give their walnut-sized prostate a name and take him to the doctor for a health check. This is a novel concept that I launched in my electorate of Capricornia. The aim is to raise the profile of prostate cancer, which kills more men than breast cancer does women. The idea is to kick-start a conversation amongst Australian men to crack open what is a taboo topic. I will explain more about this radical idea shortly. 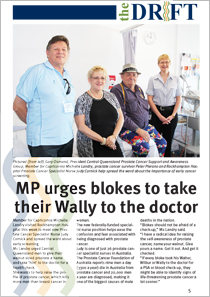 But, firstly, the reason I raise the topic is because I am pleased that the Australian government is now funding the services of a new specialist prostate cancer nurse for the Rockhampton region. Nurse Judy Cornick will work with patients at Rockhampton base hospital. The new position will help to ease the confusion and fear associated with being diagnosed with prostate cancer. The Prostate Cancer Foundation of Australia reports that nine men a day, or 3,300 a year, die in Australia from prostate cancer, while 20,000 men a year are diagnosed, making it one of the biggest causes of male deaths in the nation. The prostate is about the size of a walnut and is located immediately below the bladder. As I said earlier, if you are a bloke, I challenge you to name your ‘walnut’. Give yours a name, get it out and get it checked. If every bloke took his Walter, Wilbur or Wally to the doctor for a PSA or a blood check-up, they might be able to identify signs of life-threatening prostate cancer a lot sooner. Rockhampton insurance agent Peter Peirano is a prostate cancer survivor who named his walnut ‘Old Bitey’. Recently, Peter joined me to welcome Nurse Cornick at Rockhampton base hospital and bravely spoke about his experience to the media. A week or two later, a man stopped Peter at the Rockhampton airport and thanked him. He had read Peter’s story in the local newspaper and had taken his walnut to the doctor for a health check. His medical tests came back positive, and the man was waiting for his flight to Brisbane for immediate treatment. To generate more conversation about this topic, I challenge every male MP and senator in Parliament House to name their walnut. Christening your Walter or Wally may kick-start a conversation that could well save your life—something for which all your family will be grateful.